Metal detectors can be used on building sites to find underground pipes, and they are also popular with people who enjoy treasure hunting. If you have a need to use a metal detector as part of a work project or you simply want to try one out for treasure hunting hobby, you can rent this tool easily and affordably. Is using a metal detector new to you? These tips will help you get the most out of your equipment rental. 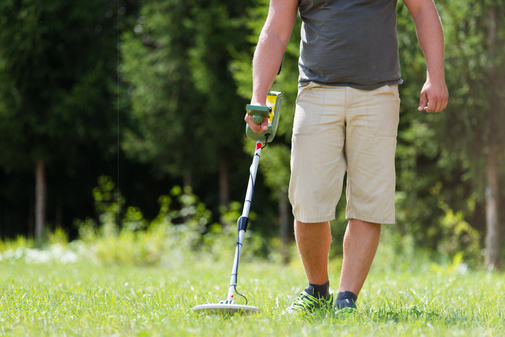 Getting your sweep right is critical to using your metal detector effectively. The detector itself needs to be close enough to the ground to actually detect buried metal, but it can’t be so close that it touches the surface. Many people have a tendency to sweep back and forth hurriedly, in short swings. However, this technique won’t give the detector enough to time to thoroughly penetrate and scan the surface. Instead, sweep slowly, in long back and forth swings, to methodically cover the area. It can helpful to test your metal detector before you start using it. Bury a few coins and nails, and then see if you can find them again with the detector. Doing this will help you get used to the sounds the detector makes when it finds something and will give you a feel to how strong the detector’s sensors are. Be sure to use a few different kinds of metal, so you can see if the detector is better at finding some kinds than others. When you search an area with your metal detector, take a methodic approach. Work slowly and deliberately, finishing your search of one point before moving on the to next. Using this kind of approach will help to ensure that you thoroughly search the area and don’t leave any parts uncovered. If you need a metal detector for work or hobby use, contact A Tool Shed. We offer flexible and affordable equipment rentals in San Jose, including easy-to-use metal detectors. For more information, call (800) 286-6574.